Dr. Janene Luther Szpak is a board-certified Psychiatric Mental Health Nurse Practitioner with nearly twenty-five years of experience providing patients with mental health services. Her goal is to improve overall wellness. She specializes in managing depression, anxiety, PTSD, ADHD, Bipolar, intimate partner violence issues, palliative care needs, and substance abuse. A patient-centered model allows her to empower the individual as an integral part of constructing the plan of care. She earned her Doctor of Nursing Practice Degree and Master of Science in Nursing Degree from Robert Morris University and her Bachelor of Science in Nursing Degree from Carlow University. DR. SZPAK IS CURRENTLY ACCEPTING NEW PATIENTS. SHE ACCEPTS ALL MAJOR FORMS OF INSURANCE. PLEASE CONTACT THE PRACTICE AT 724-934-3905 TO SCHEDULE AN APPOINTMENT. Dr. Szpak treats her patients with a holistic approach which encompasses the needs of body, mind, and spirit. 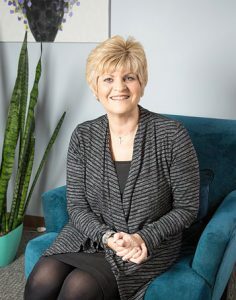 From her years of working with patients, she subscribes to the philosophy that all individuals can begin to heal when they feel “heard.” Dr. Szpak provides psychiatric diagnosis and medication management utilizing pharmacologic and non-pharmacologic treatment modalities. These are based in current evidence-based practice and clinical guidelines. Additionally, Dr. Szpak is an Associate Professor at Robert Morris University where she teaches Psychiatric Mental Health nursing courses to undergraduate, graduate, and doctoral students. She has presented on multiple mental health topics regionally, nationally, and internationally. Her published work focuses on anxiety, self-injurious behaviors, and using simulation for inter-professional training of healthcare clinicians. Dr. Szpak is from the Pittsburgh area and is a true black ‘n gold sports enthusiast. She welcomes the opportunity to work with you and meet you. All content © 2012-2019 New Directions Counseling Services, LLC.